Hi friends! I hope you had a great weekend! We had a pretty productive one as we move closer and closer to moving into our new home! I had asked a few of you on Instagram Stories over the weekend if you were interested in me chatting about all things COZY here on the blog because obviously as part of Cait's COZY Corner, I want be to sure to include a few of my favorite cozy things for you all. I couldn't believe how many of you were so excited about this little series I'll be bringing to you over the next few months and I can't wait to share what we'll be adding to our home as well as closets, kids rooms, travel and more! Everyone deserves a little cozy in their life so I'm happy to be that person to bring it all to you and shop in one spot! So let's get started shall we? 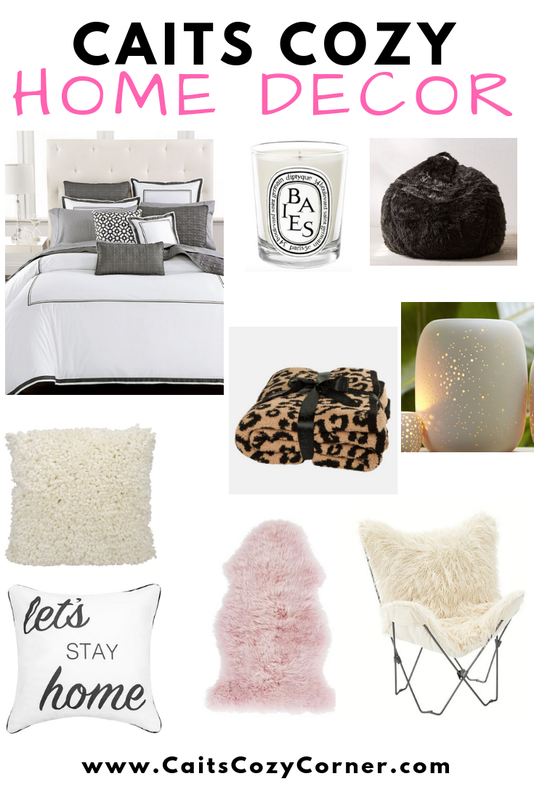 I've rounded up a few of my favorite cozy items for our bedroom, which was a request from a few of you! I hope you're able to make your bedroom a little cozier as we move into the cooler months and make you actually want ( or able ) to stay in bed all day! PILLOW. LEOPARD BLANKET. CANDLE. COMFORTER. FUZZY BEAN BAG CHAIR. FUR CHAIR. That chair and rug look so cozy! I love your picks. I am currently decorating our room. These are great picks! I love the tealight candle! I love these picks. I am all about making a room feel cozy and pillows, twinkle lights, and candles are my go-tos! Love that pillow -- I think I need it ASAP. I'm all for cozy home decor. Love all of your picks! OMG all of these look so cozy and GIRLY. They'd be perfect additions to my home. I'm not sure my husband would agree but who cares LOL. I'm living for that chair, so cute! Love those pillows - gotta love cozy. Give me anything that's plush or fuzzy! Loved your picks - some of these pieces would go great for my girls' rooms too. I am so ready to break out all the cozy blankets! I love the leopard one! I love your picks! That blanket has my name all over it! I'm in the process of decorating my room and this is great inspo! Oh, I want that fur chair! It looks super cozy for sure!! I love the thought of a cozy corner! Thanks for sharing!